Play the game online for free here! Double Fine, courtesy of the Major Bueno team of Benedikt Hummel and Marius Fietzek, have released another adventure game starring Tim Schafer as he prepares to host the Game Developers Conference awards. This time the game throws out the classic LucasArts interface for one heavily inspired by the platform adventure mechanic of The Cave. Get Tim past the bouncer backstage so he can host the GDC awards. 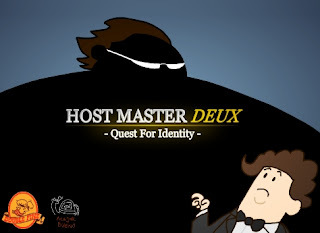 Like the original Host Master, there are multiple endings to be found.